Click to download and install the latest version of ffmpegX for MacOSX 10.2 and 10.3. This guide provides a step-by-step process to convert a Final Cut Pro® 4 rendered project into a VCD. You have created your own movie with Apple Final Cut Pro®. Now you want to encode it into a VCD with ffmpegX and burn it to a CDR for playback in your DVD player. Note: VCD resolution will reduce image quality if your source movie is based on DV footage, as VCD uses a smaller screen size than DV. Depending on formats accepted by your DVD player, you could prefer to convert your project to CVD, SVCD, or DVD formats which use a bigger screen size so as to get a better image quality. 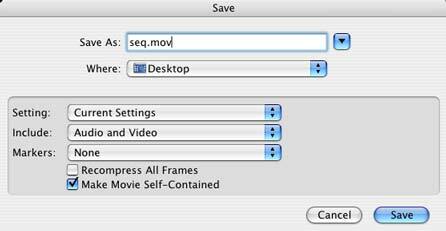 First save your project in Final Cut Pro® and select the File > Export > Quicktime Movie... menu. 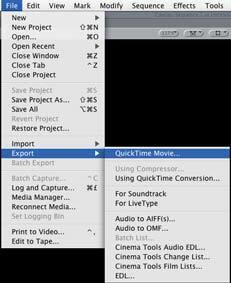 Export your project to a self-contained Quicktime movie. Always include audio and video to avoid an audio not found error at encoding time. Now open ffmpegX and drop your self-contained Quicktime movie over ffmpegX icon to open it. A default "Save as..." name is set by ffmpegX. If you want to change it, edit the Save as.. field or click the "Save as.." button to choose a location and name for the output movie. If you don't add the file extension (.mpg), ffmpegX will add it automatically at encoding time. Click the "Quick presets" pulldown menu and choose "VCD (mpeg2enc)". The codec used by this preset is "mpeg2enc mpeg-1". An 80 min CDR will hold a maximum of 80 minutes video in VCD mode. If you want to fit more video in a single CD, try the "KVCD" preset - which can fit about 100 minutes of video in the same CDR by using variable bitrate compression and a special quantization matrix. If your movie does not fit in a single CDR, make sure the "Split" option in the Tools tab is enabled. 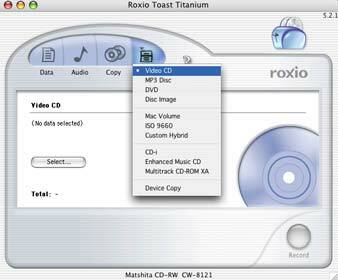 The Split "Auto" setting will automatically split the output into multiple CDs as soon as the CD size (as specified in the Video tab) is reached. Make sure that "Decode with Quicktime" option in the Options tab is enabled (it should be already enabled by default). If you use a G3 Macintosh, you must disable the "Altivec" checkbox in the Options tab. If your source movie is based on DV footage, or comes from a camera or TV source, it is most probably in interlaced format. However, the mpeg-1 standard used in VCD does not support interlaced video, so you must deinterlace it. Go to the Filters tab and enable the "Deinterlace" filter. You may also enable the "Denoise" filter to reduce the image noise (the denoise filter will also activate a better deinterlace method). Encoding takes places in ffmpegX Progress window. You can continue working with other applications while encoding. OSX Unix core reallocates processor ressources in realtime as needed. Locate the encoded files directory by clicking the icon. If you burn with Toast® 5, select the "Video CD" option in the "Other" tab, drop the .bin file on the window (you can ignore the .cue) and burn. If you burn with Toast® 6, select the "Bin/Cue files" in the "Copy" tab, drop the .cue file on the window and burn.